Cap up to 8 cm, at first hemispherical then expanding to convex or almost flat, ivory, cream, pale ochraceous, yellowish, rarely spotted pinkish or reddish. 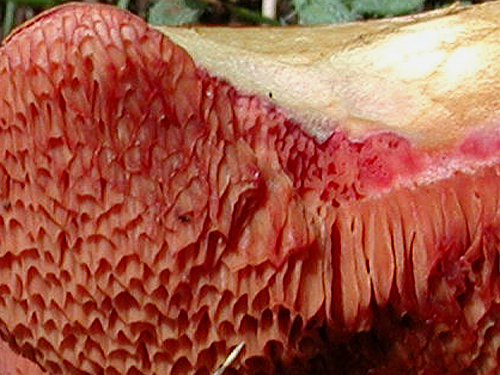 Stipe cylindrical or ventricose, usually tapering towards the base, yellowish, below the tubes tinted carmine. Flesh cream or yellowish, yellow in the stipe base, unchanging when exposed to air. Tubes carmine or pinkish red, unchanging when exposed to air. Pores carmine or pinkish red, unchanging when bruised. Smell not distinctive. Taste slightly acrid or bitterish. Spores 10–13 × 4–5 μm. Habitat. Coniferous forests, mycorrhizal with spruce (Picea), pines (Pinus) and probably fir (Abies). Distribution. Scattered in Europe, but everywhere rare and localized. Similarity. Rubinoboletus rubinus is similar and might be confused with Chalciporus amarellus. Rubinoboletus rubinus however has different cap colour, spores of different size and shape, and grows under broadleaf trees. Note. There are some taxonomical and nomenclatural problems with the name of this species. Klofac (2006) considers that the name Chalciporus amarellus is misapplied, while other obstacles prevent the use of other possible names. 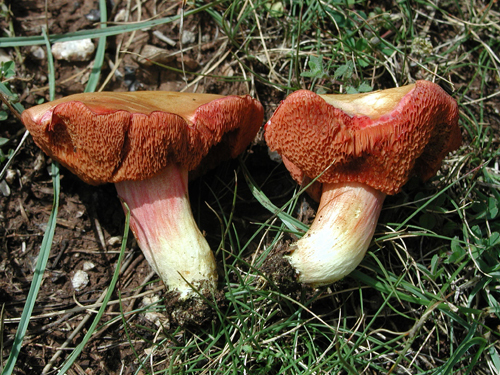 According to Klofac Chalciporus pierrhuguesii is not described in its “most typical appearence”, Chalciporus pseudorubinus is invalid and the delimitation of Chalciporus xanthocystis is based on inconsistent characters. 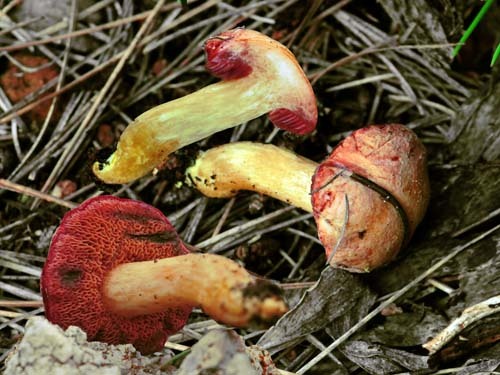 Here, I prefer to keep the name C. amarellus until solution of this problem is achieved. 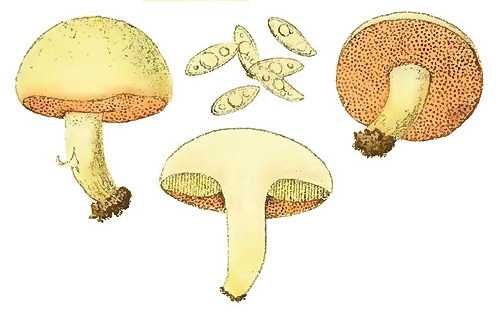 The original illustration of Boletus pierrhuguesii, a name considered a synonym of Chalciporus amarellus.